FIIs created bullish positions in the derivative segment which, they created 5,051 long contracts in the Index Futures while simultaneously reducing 6,737 short contracts. Positive progress on China-US trade talks in Washington may boost sentiments. Oil has rallied 23% this year with OPEC and allies cutting output. Crude oil price and rupee vs USD, both of which are unfavorable for the economy currently. NIFTY is trending down for 8 days or in other words, it daily closing at a lower price than previous day’s close. Nifty is now struggling on Tuesday; Nifty looked like a positive session after seven days of losses but, witnessed selling pressure during closing hours, marking the count of losses to nine days. Nifty50 registered its biggest losing streak since 2015 as it dropped for the eight consecutive days in a row, but managed to close a shade above 10,600 levels. The last time when Nifty50 fell consecutive for 8 straight days was back in March 2015 when the index was trading around 8,600 levels. This came in even as local mutual fund flows get stronger & markets heavily oversold. Foreign investors continue to sell keeping in mind the geopolitics & the risk of retaliation by India against Pakistan. Nifty likely to face resistance at 10720 and support at 10580. 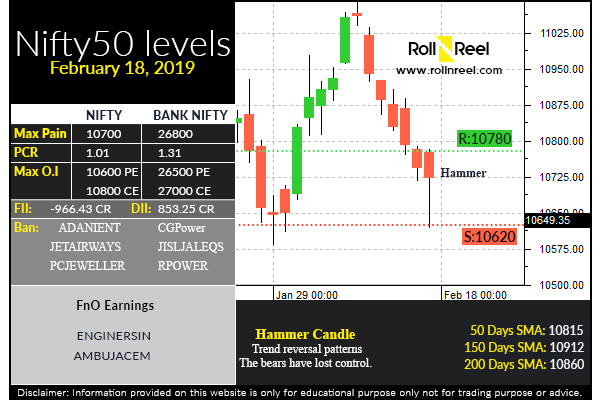 Nifty formed Inverted hammer on daily scale this shows evidence that the bulls are stepping in, but the selling is still going on. Nifty Bank PCR at 1.24.